Last blog post, I shared what two weeks of my exercise program looks like and shared some of my Gatorade Summer of Sweat goals with you. I had reached 230 lbs when I partnered up with Gatorade, and I’ve lost 5 lbs (only 5 more to go before reaching 220 lbs which is my goal). Jumping right into it, Wednesdays are my leg and shoulders or leg and ab days. Having a plan like this is amazing when you’re busy and have a limited amount of time to be in the gym. Getting to the gym without a plan means you may waste a good portion of your workout figuring out what to do. In order to be effective you need to step in the door mentally prepared – just like an important meeting or a job interview. It’s no different – your workouts are important meetings with yourself (in this case, you’re always the boss). Although I am my own boss; I own and operate my personal training facility and Gym, Kalev Fitness Solution, my days are predominantly spent at a desk just like most people. Running my business, managing a team, paperwork… you name it! Sitting at a computer all day, not to mention stress, can have tons of negative effects on our health. The human body is not meant to be idle (and I am no exception). Anyone that knows me knows that I don’t like sitting still for a long period of time. I’m always moving. This is why mid-afternoon workouts are great for me. This way I don’t leave my body sitting still for too long. If you don’t have time or the option of a full workout during the day, make sure you’re getting up from your desk to walk around at least once an hour, or bring your runners and walk around the block on your lunch break. You’ll feel energized for the rest of the afternoon instead of hitting a “wall”. My new TRX suspension training system helps me improve my balance, flexibility and overall strength (especially core). I do a lot of isolated exercises (a lot of weight training is based on isolating muscle groups). This is effective for developing muscularity. It’s important to include compound and integrated exercises in my routine so I continue to develop postural and stabilizing muscles – it’s a full body workout! TRX systems and resistance bands are great summer workout gear. They’re light and portable so you can take your workout outdoors. Perfect for my Summer of Sweat with Gatorade! After a light workout, you’re still sweating. Hydration is key to an athlete’s performance. 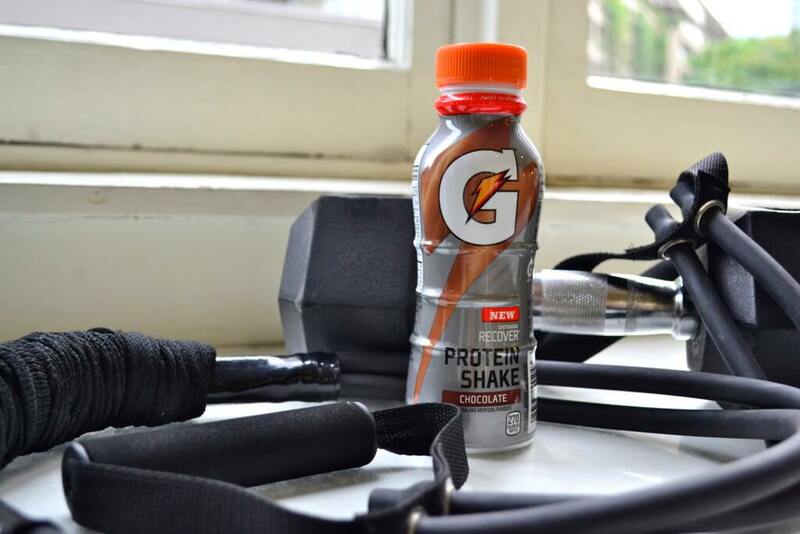 Replace the electrolytes you sweat out with a Gatorade G2. Like all engines, the body is built to run on a specific type of fuel, and carbohydrates in the form of sugars just so happen to be that fuel. Not only do you lose water and electrolytes in sweat, but you also burn through carbohydrate stores rapidly. Gatorade Thirst Quencher is tailor made to deliver sugars to the brain and muscles. Sugars allow your muscles to go longer and harder and fuel your brain so you can concentrate, helping you make those important split second decisions when they matter the most. Zero calories means zero energy. All athletes need calories to create energy for muscles during training or a workout. G2 has less than half the calories of Original Gatorade to deliver hydration during lighter exercise or competition. Learn more about the benefits of Gatorade G2 at www.gatorade.ca. Flashback! My team and I demonstrating Core Rotation exercises using resistance bands. A workout such as this, which includes a bit of everything (cardio, compound and isolated weight training, as well as core) will definitely make you sweat. 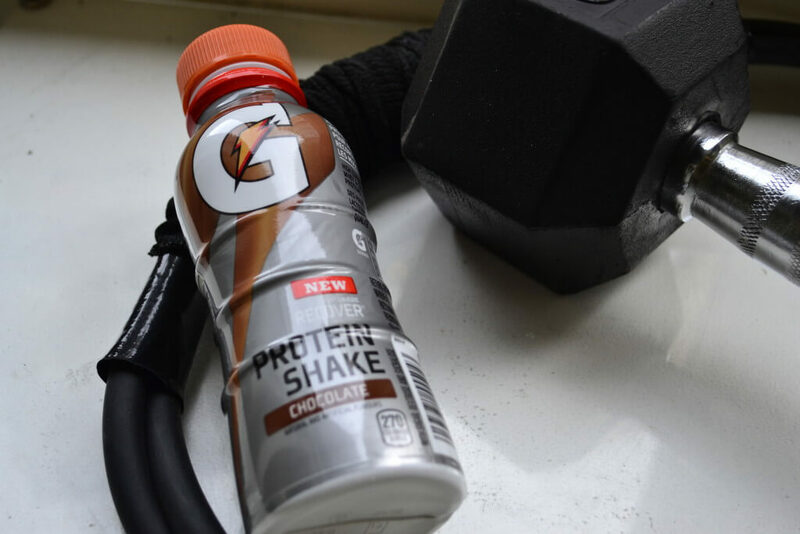 I drank an Orange G2 during my workout on Wednesday to stay hydrated and replace the lost electrolytes, then a Chocolate Gatorade Recovery Protein Shake immediately after. If you’ve read my previous blog posts, you might be tired of hearing about me on the ice (can you tell it’s almost hockey season!? ), but suspension and resistance training is great for hockey players. Without good stability, core strength, flexibility and range of motion, I’d be sore and possibly strain my muscles after every game. We don’t play to get hurt and being bigger than your opponent doesn’t help if they’re faster and more agile than you – I don’t want to be a bully on the ice, I want to be a good athlete and score goals. Check back again soon to see how far I’ve come on reaching my goals, and how I plan to #KeepSweating even after the Summer of Sweat!